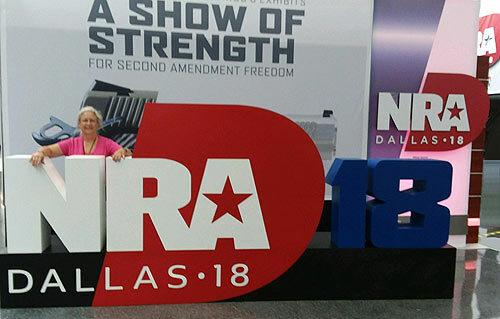 I am enjoying the NRA convention, and was invited by the NRA to take a new class. Loved the new class and meeting Training Counselors from around the country. So much to see and do, having a great time in the process! Hi Everyone, We are so excited about the fall season! Come on out and find out, because there is more! Your dues of $50 a year is supporting a women's organization, taught by women with experience in teaching and competition. So if you're looking for quality education and stretching the dollar than look no further. 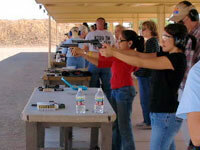 Come and visit us at the Arizona Women's Shooting Associates, for the quality education in a fun and safe environment. Arizona Women's Shooting Associates was formed by women to support and encourage other women, families and friends to become involved in the shooting sports. "bug", have a great time, enjoy the comradery and the great outdoors. AWSA teaches with repeated drills to create muscle memory to help in the defense process. 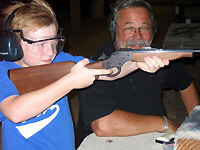 Knowing the condition of your gun at all times is strictly enforced by the safety rules. The student will become aware that this is not only a fun sport, but also a thinking sport. 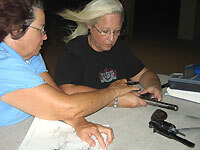 Learning to plan their shots for competition and knowing when to reload for example. 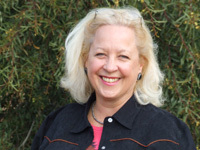 AWSA is a ladies group on the move. They might be sitting, kneeling, prone, standing or running. To get you to this point is our goal, and having fun doing it. 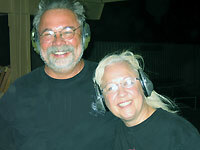 All instructors are NRA certified a combined 30 years of firearm instruction.